UGA junior placekicker Rodrigo Blankenship has been named to the 2018 SEC Football Community Service Team, the conference announced on Wednesday. Each year the SEC highlights one player from each school in all 21-league sponsored sports who shows exemplary community service. Three-time recipient of Alabama Football’s Derrick Thomas Community Service Award … Instrumental in Alabama Athletics choosing the Alberta Head Start program as the focus of its community Unity Project, which is a department-wide initiative involving student-athletes, coaches and staff … Has given more than 200 hours to community in addition to serving as a mentor and role model for his teammates and fellow student-athletes. 2017 Fall Academic Honor Roll … 2015-16 First-Year SEC Academic Honor Roll … Participated in Lift Up America … Visited with Boys & Girls Club children at post-practice event … Worked with Blue Cross Blue Shield at Bud Walton Arena to pack meals for families in need for the Fearless Food Fight … Visited Arkansas Children’s Northwest Hospital multiple times interacting with sick children. 2018 Wuerffel Trophy Watch List and AFCA Allstate Good Works Team nominee … Two-time SEC Academic Honor Roll recipient … Represented Auburn the past two years at the SEC Student-Athlete Leadership Council for football … vice president of the school’s Student-Athlete Advisory Council … Took part in a mission trip to the Dominican Republic in May 2018. 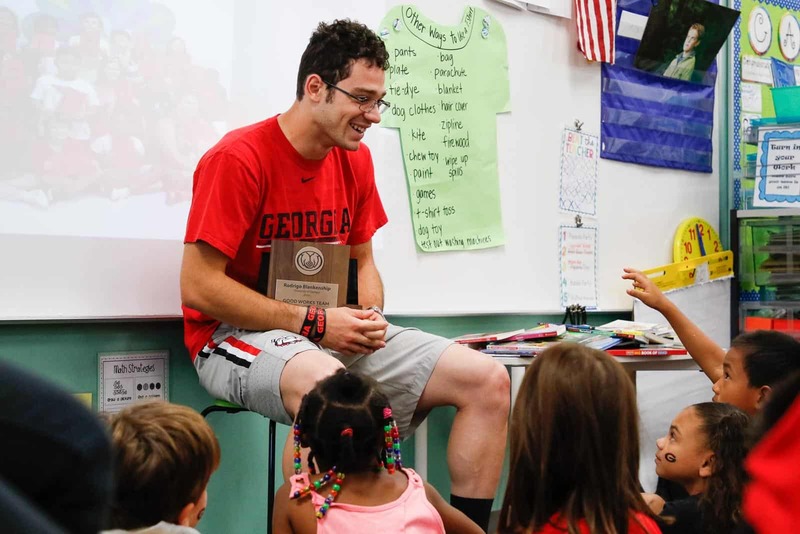 Only SEC player on 2018 Allstate AFCA Good Works Team … Member of the UGA Athletic Association’s Leadership Academy (L.E.A.D.) … Visitor at Camp Sunshine, which is a camp that provides support programs for children with cancer and their families … Volunteer for the “Empty Bowl” luncheon, which is a luncheon sponsored by the Food Bank of Northeast Georgia. Has contributed hundreds of hours of community service during his time at Kentucky … In 2018, created “Tuesdays With C.J.,” in which he visits the UK Children’s Hospital every Tuesday to spend time with patients and their families … Captain of UK’s chapter of “Team Impact,” in which he organized and hosted a “Signing Day” news conference for an 11-year-old with cystic fibrosis, a youngster who has been with the UK football team all season. Chair of SEC’s Football Leadership Council … Serves as an advocate for the American Diabetes Association … Has participated in numerous community events with the American Diabetes Association, including working youth camps for juveniles with diabetes … Invited to Washington D.C. over the summer to take part in the ADA’s Call to Congress, where the organization helped raise money for diabetes and diabetes awareness. Two-time Wuerffel Trophy nominee … Started Patterson’s Footlocker, which gathers and donates socks to homeless shelters … Volunteered time with the Special Olympics … Other volunteer pursuits include participating in Reading Across America Day, assisting with the Adopt-A-Basket initiative during Thanksgiving, visiting patients at Batson Children’s Hospital, and other community initiatives. A 2018 nominee for the Wuerffel Trophy … Volunteered for projects routinely, including Read Across America … Has served as a mentor with Quad County Alternative School … Spent time at Ward Stewart Elementary garden, local hospitals, escorting local elementary students to school and volunteering at MSU’s youth football camps. 2018 Dr. Harris Pastides Outstanding Student-Athlete … 2017 USC Co-Community Service Award … 2017 SEC Community Service Team … 2017 SEC Fall Academic Honor Roll … Has volunteered regularly at the VA Hospital, met with cancer patients, read to children multiple times. Selected to be a part of the VOLeaders Academy, a university and athletics program where student-athletes enact positive change through athletics … Participated in the adapted Sports Fest, worked with Club Vibes, which helps visually impaired young people, and assisted in the organization of Tennessee’s annual VOLoween event … Participated in Read Across America Day initiatives and made time to read to children at local schools throughout the year. Member of the Student-Athlete Advisory Committee … Traveled to Haiti twice with Mission of Hope … Has spent many hours in local schools in the Bryan-College Station area helping with reading programs and encouraging students to perform their best in everything they pursue … Has also volunteered at The Big Event, a Texas A&M University wide outreach to the community … Has been a camp counselor at Camp Blessings, a special needs camp.